This inaugural event brought together 328 studios and teachers from 35 states and 4 different countries who pledged to “pay their practice forward” by hosting a donation class. To all who participated in this monthlong community movement of giving, thank you. Your dedication to service demonstrates that together, we can truly make an impact and share yoga with the world. 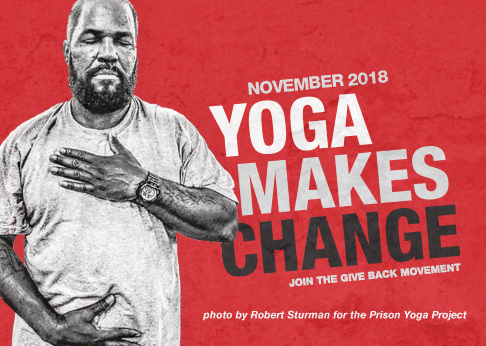 The funds you raised will make a powerful collective impact to make yoga more accessible to underserved populations; and to train new teachers to offer yoga to veterans, cancer survivors, prisoners, persons recovering from negative body image, and those recovering from addiction. We are grateful to everyone that joined us nationwide, and around the world. You truly turned this into a yoga service movement. Partners in Service: Thank you to the studios that joined us this November. Join us in sharing the gift of yoga with those who can benefit most. Learn about ways to get involved with the Give Back Yoga Foundation. Mary Sims: Yoga Supports Self Advocacy Airport Yoga: Connections Made!